Even though we are living in a world that is becoming increasingly dangerous, a world ruled by ignorance, greed and aggression and rife with every type of suffering imaginable, a world that is for many the worst of times, for us it is the best of times. We have received not only a human rebirth but a perfect human rebirth, which gives us every opportunity to practice Dharma to the fullest possible extent. The complete teachings still exist, as do realized teachers who can explain them to us and guide us in our practice, and we have an interest in Buddhadharma, the intelligence to understand it and the ability to integrate the teachings with our life. 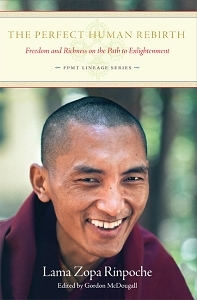 In this book, Rinpoche explains in the greatest possible detail just how precious this opportunity is and why we should not waste a moment of it. 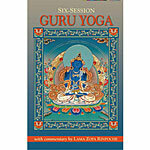 Like the other books in the FPMT Lineage Series, this volume will be a treasured resource for those meditating to receive lam-rim realizations, for those teaching the lam-rim to others, and for all wanting to get a deeper understanding of the Buddha’s teachings and how they benefit all beings. Paperback, 2013 edition, 230 pages.